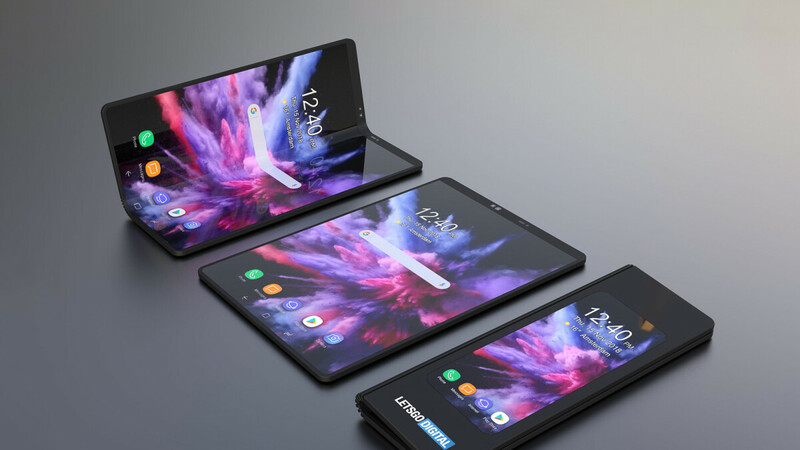 Over the years since it was first teased, Samsung's foldable phone has become a bit of a joke, with many doubting that current consumer-grade tech is where it should be to deliver the company's ultimate vision. And seeing as how the device remained in prototype state for such a long time Samsung must have realized this full well. However, tech has progressed to the point where Samsung's R&D believes that foldability is the next big and logical step in designing mobile devices. The company recently teased the foldable phone once again, hinting that it may have something to share at the Galaxy S10 'Unpacked' event next month. Ironically, while the happening is all about the next S-series flagship models, they may be among the last Samsung top-end phones with a 'traditional' design – that is, a rigid device that is bound to the size of its display. In a recent editorial, Senior Vice President and Head of the Visual R&D Team at Samsung's mobile division Hark-sang Kim reveals that developing a new form factor that resolves the contradiction between screen size and portability has become the central focus of the company's innovation efforts. "Despite current trends, we are still living in a world where the size of the smartphone display can only be as large as the device itself," writes Kim. Samsung's official Galaxy S10 Unpacked event teaser has a 'fold' running down the middle. Could this be another hint at a surprise reveal? We've discussed in the past how the notch is a stopgap on the way to the all-screen phone, but many analysts claim that achieving this vision will bring us to the limits of design innovation possible on the current form factor, leading to even smaller and more incremental updates between generations. Samsung is trying to think ahead and solve this issue by transitioning from a rigid construction to a flexible one. The Infinity Flex Display was first revealed at SDC 2018 and signaled the start of a new chapter for the company, but prototypes of Samsung flexible displays have been publicly shown since as early as CES 2011. It took seven years for the technology to progress to the point where Samsung feels confident in the endeavor, though many would claim it's a bit early still. "We expect to see a sea change in the smartphone form factor in the coming years. From rollable and stretchable devices to the devices that can fold in multiple ways are no longer beyond the realms of reality. Samsung is ready to usher in this future and create meaningful experiences for consumers that help them do more of what they love," Kim writes. Among the biggest hurdles of designing a foldable phone is, well, the way it folds. Old prototypes, even though briefly showcased, were obviously too rigid and unnatural to interact with. The displays were also less than perfect, with prototypes from both Samsung and other companies exhibiting dead pixels and other problems with their screens, due to the panel having to bend in extreme fashions to facilitate for the design. But that's only part of the struggle. The placements of the battery, cooling system, and camera also had to be rethought for the flexible form factor. Then there's the user interface and user experience, which vary more than you'd imagine when you're dealing with a device that can drastically change the size of its active screen area on the fly. Seems like that old Samsung ad from 2013 that imagined what a foldable phone could be — silly as it may still be for other reasons — wasn't that far off in its depiction of a foldable smartphone. We just didn't know it would take 6 years for the technology to mature enough. And even if Samsung's foldable device really is the future of smartphones and launches this year, it would still take a generation or two for the new design to catch on and be embraced by the industry, if it ever does. The foldable form factor would first have to prove itself a viable replacement to what we currently have. Samsung says the phone can withstand "hundreds of thousands of folds," but as with any emerging technology, the first generation is often a testing grounds for new ideas and it is very important how the stage is handled. This can make or break a new format, as we all know. Whether the future is as bright as Samsung's R&D envisions — or rather, whether the technology is there for the vision to be achieved in the near future — is too early to say at this point. Rest assure, however, that we're going to be hearing a lot more about Samsung's foldable phone this year, if not even see it on store shelves in the first half. Foldable/rollable/stretchable phones are the future. This is only the beginning, and I can't wait to see what's in store for this category. I can definitely see that it's the future, especially when you have a smartphone and a tablet in one device. It will always mean that you have very small tablet with you. You would still need tablet if you want to enjoy big screen. If that's what you think, you need to expand your imagination a bit. Midan we know your an Apple zealot. But when Apple introduced the iPad minis they quickly we're out selling their bigger iPads. That's a fact, even Apple admitted that fact. Try to think midan if you have a smartphone with a 6" or 6.5" display. Then a device with two 6.5" screens would have a display that is over 7 inches when unfolded. Maybe Apple saw this coming and decided to kill off their iPad minis. Especially since foldable displays have been talked about for a couple of years now. I remember so many Apple zealots were saying OLED displays are terrible. Now you are enjoying Samsung's OLED displays in your latest iPhone flagship devices. It's going to be the same for these foldable displays. They come to Android first, just like all these great technologies come to Android. We will test them out for your future iPhones. Just like this year we are going to try out 5G as well for your 2020 iPhones. Midan you should hug an Android user, knowing they are trying this new technology first and making sure there is no kinks in this technology. Who knows if I see you on here when I get one of those new displays, then I will keep you informed on how well it works. IPad mini was only popular because big iPad was bulky and heavy, all that changed with iPad 3, it offered best of both worlds and right away mini sales went down. That's why Apple kil it because lot more people started to buy the big ones because the screen is so much bigger and yet the product is not heavy etc. "now. I remember so many Apple zealots were saying OLED displays are terrible. " Well that was true, iPhone X OLED was the first OLED screen i could buy. Why? Because it doesn't look like traditional OLED screen. It still looks more like a LCD but with little improvements. Knowing how Apple made their OLED screen look different than anyone else quite proves the point. Remembered wrong, it was iPad Air which changed it, that was first iPad to offer best of both worlds. You do know the iX uses a samsung display of the same generation of the note 5 or s7. A display that was 2yrs old at the time. The only thing they did different is color calibration that is more of a personal preference thing then anything else. I'm really excited for this new form factor as well. Finally, we can make some progress from the regular rectangular phones to a foldable phone with more screen! It would really be helpful for my long commutes on the subway, where I can probably enjoy some Netflix or Youtube. Agreed fo sho. The biggest advancement for these devices will no doubt depend on newer battery technology. These batteries have to be flexible, more reliable, and more efficient in order for foldable devices to flourish. It might be, but not near future. Going to take years. Also i'm not sure people want to unfold their device everytime when they want to use the full potential of it and again fold it after use. Always when you need screen you have to decide do you want to use smaller or bigger screen. The problem will still going to be screen size. Do we really need little bit bigger screen over current and is it worth off all this hazzle. Still if you want truly enjoy bigger screen you have to have tablet too. Also think watching movies with that weird aspect ratio. You would lose so much of your screen watching those huge black bars. Propably the movie is not much bigger than with current big screen phones. Still lot of things to figure out before it could be mass product and i'm not sure if it will happen in a long time. But interested to see how they are selling this product to people. Midan if you went to any CES show, then you would have seen foldable OLED screens since 2013. Plus each year they continue to improve them. You act like this is the first year they were making these displays. When in reality they have been working on them since 2013. Six years ago. It's only this year that they are confident enough to put them into production. Who knows they might have some production flaws, or software bugs to work with these new foldable OLED displays. But we have to wait and see. Also the screen size will be significantly larger, especially when you put two 6.5" displays together, then it's over 7 inches. I for one will get one if the price is right. A smartphone and tablet in one device is a game changer for many. Maybe these displays might make it in the new iPhones for 2021. Something like this would kill off Apple's iPad minis for sure. Especially if Apple made an iPhone and iPad in one device. Super long screen wouldn't look odd? Yeah I wondered the same thing. Bezels in 2018 kept getting smaller and smaller, but with this device, Samsung didn't care about minimizing the bezels on the outside screen. Then open it up to get a big screen. Problem solved. So right now I currently carry my note 9, XS Max and Tab S4... If I could have a foldable device that I can carry that acts as a phone and a tablet I'd be unstoppable! Price will be an issue for early adoption and growth. Average price for a foldable phone will be over $1000. Nobody would expect it to be any less for this cutting edge technology. Especially since you would be getting a smartphone, phablet, and tablet in one. Am I the only one who is extremely excited about Foldable phones? Honestly don't care for these minor upgrades each and every year. Need something more unique. More exciting. I love unique and exciting, but I'm not 100% sold on foldable phones yet. I'm also not a tablet user, so I may be in a minority here. Personally, I don't care for a huge screen on my phone, UNLESS it had incredible processing power and could be docked and used like a laptop/desktop. All the Samsung smartphones and most Android devices allow users to plug in keyboards and mice. Plus Samsung has their Dex mode, which is basically a desktop on a smartphone. You can even plug it into a monitor. So I don't see why Samsung wouldn't allow the same thing to happen here as well. When Samsung the industry leader says so, everyone will start to follow. I remember in 2010, I bought my first smartphone. the 5" Dell Streak. At the time, the 3.5" iPhone was the king. People laughed when they saw it. Why would you need a phone with such a LARGE screen. I would welcome a 4-5" phone with an opened 8-10" tablet screen, but, with the first couple of generations, I'll pass...let the early eager beavers work out the bugs. I can wait. I'll be the beta tester. I waited too long heading to halve a century old and since the early days of the O2 flame back in 2000, the phone aesthetic have not fundamentally change. ie, the touch input screen pocketable phone/pc combined. I have high hope for Google glass, ODG, vuzix, epson moveria etc but they either disappointing since most are on preorder for the last 5 years or release with subpar experience such as the hardware.